In the rolling, forested highlands of the Black Hills, four thousand archaeological sites spanning 12,000 years attest to a long relationship with native people. An oblong ridge circles the Black Hills, separating them from the surrounding prairie grasslands and making them “one of the most unusual environmental features in the United States,” according to anthropologist Peter Nabokov. In the 1700s and 1800s, the Lakota ceremonial season began each spring with the stampede of buffalo from the Black Hills through Buffalo Gap. As the people followed the buffalo, they would go to places like Devils Tower and Bear Butte, their pathway forming the shape of a buffalo’s head. As Lakota scholar Vine Deloria tells it: “In the spring, the people would follow the buffalo herd and they’d have to do a series of four ceremonies, the last one of which would either end up at Devils Tower or Bear Butte depending on what year it was and what the situation was. This is written down now in a book on star knowledge” which illustrates the relationship between the constellations, land formations and movement of Lakota bands within the Black Hills. The Lakota believe that permanent occupancy of the Black Hills was set aside for the birds and the animals, not for humans. The U.S. government initially tried to prevent settlement of the Black Hills, having signed the 1851 Treaty of Ft. Laramie, which promised 60 million acres of the Black Hills “for the absolute and undisturbed use and occupancy of the Sioux.” Settlers were aware that the Black Hills were sacred, considered the womb of Mother Earth and the location of ceremonies, vision quests, and burials. Initially, the newcomers accepted the fact that the Hills belonged to the Lakota—until gold was discovered. When they heard the rumors of gold, they clamored for access to a vast area that had previously been avoided for fear of Native American attacks and because of the 1851 Treaty. Now, the issue is whether tribal sacred lands taken in the nineteenth century can be bought and sold in the twenty-first. After a century of struggle to file claims in court against the illegality of the 1868 treaty, the Indian Claims Commission, the Court of Claims, and finally the Supreme Court in 1980 recognized the 8 Lakota Nations’ rights to the part of the Black Hills specified in the 1868 treaty. But instead of ordering the government to return the land, the Claims Commission awarded a financial sum equal to the land’s value in 1877 plus interest. This sum now totals $570 million—a considerable amount but still much smaller than the value of the natural resources which have been extracted from the Black Hills, estimated at $4 billion. The Lakota have refused to accept the money on the grounds that one cannot buy and sell sacred land. Says Johnson Holy Rock, a Lakota elder and former chairman of the Oglala Sioux, “We don’t think of the air and water in terms of dollars and cents.” Two political plans in the 1980s (one spearheaded by Senator Bill Bradley) to return 1.3 million acres of federal land in the Black Hills were defeated by the South Dakota congressional delegation, including Senator Tom Daschle. Over the years, the Black Hills have experienced mining, logging, and recreational uses, often in violation of Lakota beliefs. Mining for gold, coal and uranium pollutes water. Cyanide heap-leach gold mines, such as Homestake and Gilt Edge, use cyanide to extract gold from crushed ore. The cyanide mixes with other chemicals, producing toxic chemicals which can leach into the groundwater. This sort of mining leaves huge open pits which scar the landscape, and frequently the companies are allowed to abandon the mines without cleaning up or restoring the land to its original state. Two sacred places within the Black Hills, Bear Butte and Devils Tower are on public land and are protected from natural resource extraction. However, both have endured conflicts over recreational use. Bear Butte, known as Mato Paha, has long been a site for ceremonies, vision quests, and important tribal meetings, though most Americans see the dramatic little mountain as just one of the many geographically stunning outcroppings in the Black Hills. Bear Butte became a South Dakota state park in 1961, and was placed on the National Register of Historic Places in 1973. To accommodate different uses of the park, the state created two different trails, one for hikers and one for native religious practitioners, which leads people to a designated ceremonial area. Both trails are open to the public, however non-native users are requested to stay on trail and not disturb prayer bundles or individuals in ceremony. In 1982 Lakota and Tsistsistas (Cheyenne) elders sued the state of South Dakota to prevent deeper incursions into the park to increase tourism, including a parking lot, roads, and campgrounds. They also sought to limit the state’s ability to establish new regulations requiring visitors, including traditional religious practitioners, to obtain permits. The U.S. District Court’s opinion Fools Crow v. Gullet, found that the Native Americans could not have “full, unrestricted, and uninterrupted religious use of Bear Butte” because that would constitute the state establishing a religion, and because the state’s right to open the landmark to the public was protected under the First Amendment. This was one of several cases in the 1980s which showcasedthe failure of the American Indian Religious Freedom Act to protect native religious practices on public land. Other sacred places in the Black Hills include Buffalo Gap National Grasslands, Angostura Springs, Harney Peak, and Wind Cave National Park. The Lakota believe that the Wind Cave is the place where their ancestors emerged. The site was occupied by Lakota activists and elders in 1981 to protest the 1980 Supreme Court decision that offered financial restitution for the taking of the Black Hills. The same year marked the beginning of the occupation of Yellow Thunder Camp by American Indian Movement activists, an occupation which lasted for several years but was ultimately disbanded since they were denied permits for permanent structures. The land claim settlement money sits untouched in a bank account while the Lakota, who have the lowest income and highest unemployment rates in the country, continue to demand the return of their land. California businessman Phil Stevens, who was the architect of one of the plans in the 1980s, is still working with the Rosebud Sioux Tribe on a plan for returning part of the Black Hills. Other proposals include allowing the Lakota to purchase privately-held land using interest from the settlement, or the federal government returning particular sites within the Black Hills to the Lakota. Meanwhile, politicians continue to allow the Black Hills to be violated. In late 2001, Senator Tom Daschle attached a rider to a defense bill granting immunity to the owners of the Homestake Mine, a 125-year old cyanide heap leach gold mine from the early days of illegal claims, allowing Homestake to vacate the depleted mine without cleaning up any of the pollution or reclaiming deep pits in the landscape. The U.S. Forest Service allows the Black Hills National Forest to be logged, to the point where few old growth trees remain. The Black Elk Wilderness Area, 0.8 percent of the Black Hills, is the only protected area, but even here, timber companies are pressing for access. Recreational and spiritual users of Bear Butte continue to co-exist, but native people are concerned about the growing numbers of visitors, some of whom show no respect for religious practices. State park officials emphasize their desire to provide adequate privacy for ceremonies, but they are legally bound to accommodate the land use wishes of the general public. While the native people still hope that some areas of the Butte will be set aside for their exclusive use, that seems unlikely in the near future. A strange twist to the Black Hills story is the recent attempt by Kevin Costner, director and star of Dances With Wolves, to build a 838-acre recreation resort, including ski runs and a railroad, in the lands of the people who were the subject of his film. Since the mid-1990s, Costner and his brother have been planning the resort and dismissing Lakota concerns. In April 2002, Costner met with Lakota leader Arvol Looking Horse and agreed to reconsider his development plans to better serve the Lakota. Costner has also cleaned up a trash pit dump area which was left by the Homestake Mine. Currently, only 3% of the Black Hills area is untouched, roadless wilderness, and this rider opens up the Norbeck Wildlife Preserve and the Beaver Park Roadless Area to logging clearcuts, road construction and associated infrastructure. The rider was ostensibly to protect areas of the Black Hills from wildfires and the pine bark beetle through logging. However, this contradicts the natural function of fire in cleansing a forest and the Forest Service’s own information that there are very few beetles in the Norbeck area. The Black Hills have been sacred to the Lakota and other native people for thousands of years, known as a place of extraordinary spiritual power. Within the Norbeck Wildlife Preserve lies Harney Peak, described by Lakota spiritual leader Black Elk as “the Center of the World.” Logging roads are now being built in this landscape, destroying sacred places that cannot be restored. The logging itself will have long-term impacts on old-growth trees, associated water systems and wildlife. The Forest Service has allowed the cutting of a 20 mile long, 400 foot wide buffer around the Beaver Park Roadless Area, where there previously were roads on the boundary and where all have now been upgraded. Meanwhile, 700 acres have been clearcut in Beaver Park due to the presence of pine beetles. In the Jasper fire area, which has been logged extensively, the Forest Service had previously documented 20 sacred sites. Two years ago, fire swept through the area and revealed an additional 60 sacred sites and burials. Senator Dashle’s rider prefigured a recent debate on management of all forest lands in the U.S. In May 2003, President Bush released his “Healthy Forests Initiative” plan, a companion to House Bill 1904, “The Healthy Forests Restoration Act of 2003,” both of which lift logging restrictions in the name of fire protection. In June 2003, the National Forest Protection Alliance recognized the Black Hills National Forest as one of the top 10 Most Endangered Forests in the U.S. In July, Democrats introduced a counter-bill, Senate Bill 1453, “The Forestry and Community Assistance Act of 2003,” which proposes fire protection measures without interfering with healthy old-growth forests. Meanwhile, the city of Sturgis, South Dakota and a group of private investors plan to build a sports complex and shooting range just four miles north of Bear Butte. They have already spent $250,000 of Housing and Urban Development (HUD) money on the project. 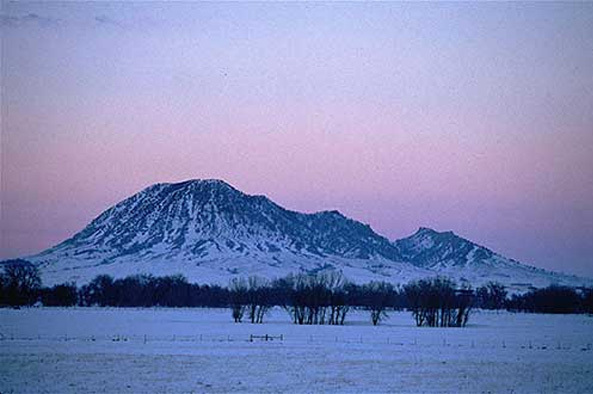 Although they knew Bear Butte was sacred to many Plains tribes, no tribes were consulted about the proposal, a possible violation of federal laws. The sound of an estimated 10,000 rounds per day being fired from rifles and handguns will disrupt the silence and serenity of people from more than 60 different tribes who come to pray at Bear Butte, as well as non-tribal people who visit to enjoy the tranquility, beauty and power of the butte. Increased traffic to the new development by patrons and employees, and to a clubhouse, motel, and restaurant that are being planned. Increased air pollution caused by firing 10,000 rounds of ammunition per day. The sounds and activity will disturb birds and wildlife in the Bear Butte area, and in particular, the eagle, which is important in Native American spirituality and ceremonies. Possible effects on patients at Fort Meade Veterans Administration Hospital from the sound of distant gunfire. While the Supreme Court case concerning the Black Hills was important because it affirmed the treaty the U.S. signed with the Lakota, the resulting financial settlement reveals the lack of legitimacy granted to Native American religions under the U.S. legal system. For this conflict to be settled, land must be returned. The story of the Black Hills and their division into National Parks, State Parks, Forest Service land and private property reveals a cultural misunderstanding of the concept of a sacred landscape. Preserving certain obvious physical features, such as Bear Butte, while mining and logging thousands of acres in other parts of the Black Hills, is a grave affront to Lakota people. Legal and political analysis of the issue must incorporate the idea of continuous, interconnected stretches of land, rather than specific locations around which fences can be erected. As has been made clear in other sacred land cases, the courts will be of little assistance until there is broadly-conceived legislation, or unless there is specific protection for an area granted by the executive branch. This patchwork of land holdings in the Black Hills provides an opportunity to develop a model for shared land management between tribes, states, and the federal government. Any co-management of land would have to take into account the fact that tribes are sovereign nations, so decisions about the land would be made in the context of government-to-government relationships. The PBS show Religion and Ethics ran a piece on the biker bar, Nov. 10, 2006. “For Sacred Indian Site, New Neighbors Are Far From Welcome.” New York Times, August 4, 2006. “A Broken Treaty Haunts the Black Hills.” Argus Leader, 2001. “Same Black Hills, More White Justice” by Edward Lazarus gives an account of the past and current exploitation of the Black Hills. Also see his book Black Hills, White Justice. A timeline of Plains Indian History 1640-1840 from the Independent Television Services’s documentary Homeland. Andrew Gulliford, Sacred Objects and Sacred Places: Preserving Tribal Traditions.